TOGAF training and certification is a good way to start your enterprise architecture career. It has become a de factor standard, and many organizations look for TOGAF certification in an enterprise architect CV. But the training has limitations, and the most important is that it you will not get a hands-on experience or a personalised training program. Some might say that there is a need for a Level 3, which provides the practical, hands-on, day-to-day advice on how to actually be an enterprise architect. 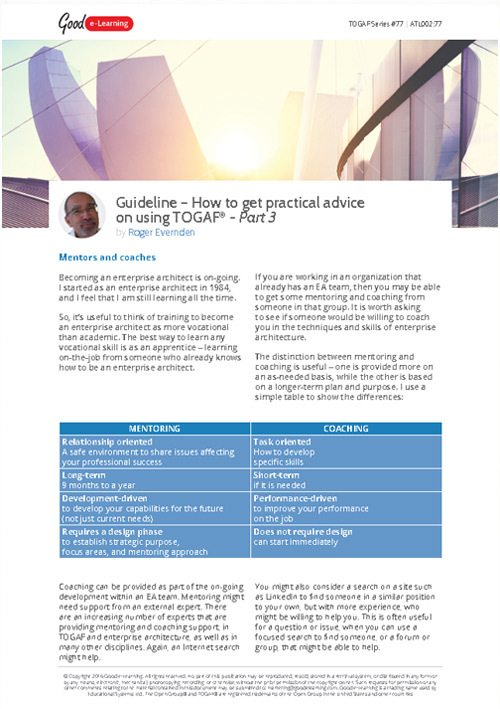 This Guideline by Good e-Learning’s enterprise architecture expert Roger Everden will give you plenty of tips and ideas on how to gain that practical knowledge of using TOGAF in real-life situations, which will also help you make the most of your TOGAF training and certification. Download this TOGAF learning resource and you’ll also get instant access to our entire library of 530+ business & IT resources for free!